Bridesmaid dresses often play a big role in a wedding's color palette. They are in effect what makes up the bulk of the color in group shots and the ceremony. It's only natural then, that the top trending wedding colors have a big influence on bridesmaid dresses. For Spring 2016, it includes a few of the usual trends, like florals and pinks; but it also includes some bold shades like bright red, a rich peachy coral, and darker shades of blue. Buttercup yellow is a rich, warm yellow that looks so much better on skin tones than a pastel yellow. 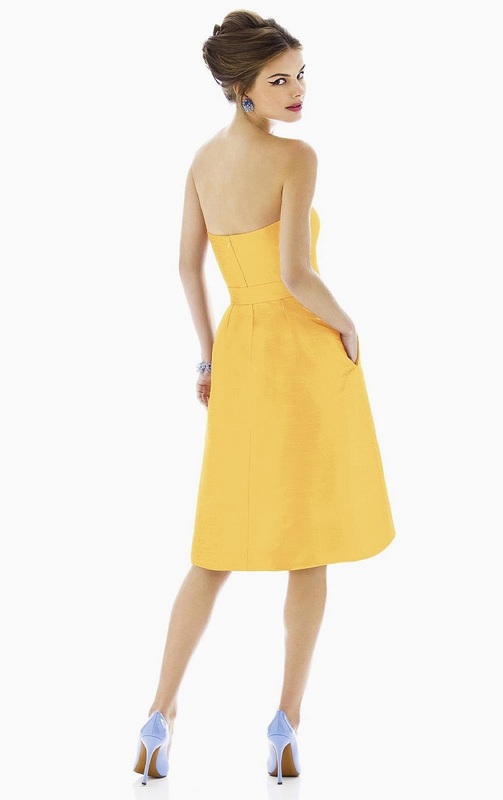 For a colorful spring wedding, pair this yellow with a bold pink or purple. If you want to pair it with a color that will tone it down, go with an ice blue or white. According to Pantone, this color trend is called "snorkel blue," but you're not going to find that shade among the choices when ordering a bridesmaid dress. If you want this medium shade of blue, try looking for "ink blue." You can stick with neutrals for your other wedding colors, but this blue also looks beautiful with pops of light pink or peach if you want to incorporate other colors in the bouquets and reception decor. This bold fiesta red is one of the most unusual colors to be on trend for the spring season, which makes it a refreshing change from the typical pastels. Much like the peachy coral shades that are popular for 2016, this shade is perfect for a spring wedding when paired with various shades of pink via the bouquets and floral arrangements. Ironically a pastel peach has been on trend for fall weddings, but for Spring 2016, the peach bridesmaid dresses are more rich and dark, almost like a coral red. It looks absolutely gorgeous with gold accents, and for some color, go monochromatic with lighter shades of peach and pink. Another growing color trend for bridesmaid dresses is white. As more brides are opting for non-traditional wedding dresses in champagne or blush pink, they are contrasting those colored bridal gowns with white or very light neutral bridesmaid dresses. This post is brought to you in part by ROSA Novias. Dying over the yellow dress! So pretty! Love the yellow!! Also, I don't want to wear a white wedding dress, so that would be fun to dress my bridesmaids in white (oh wait, I need a groom first... getting ahead of myself...haha)!! Great selection, dear! The dresses are very beautiful! Keep in touch!